WaterField Designs' Bolt briefcase is not for hoarders who want to carry every infernal gadget with them everywhere they go. Like the impossibly thin new MacBook, it's stripped down to the essentials — and the essentials are stylish, sturdy and compelling. The $249 Bolt will surprise you with its slimness. It comes in two sizes — the small one I tested holds up to a 13-inch MacBook Air (the larger model holds up to a 17-inch laptop). After sliding in an 11-inch Air, an iPad and an envelope full of documents, the Bolt was fairly full; there was barely room to toss in a pair of headphones. But that's the point of the Bolt. It's designed for carting around your must-have gear in a sleek, pleasing package. 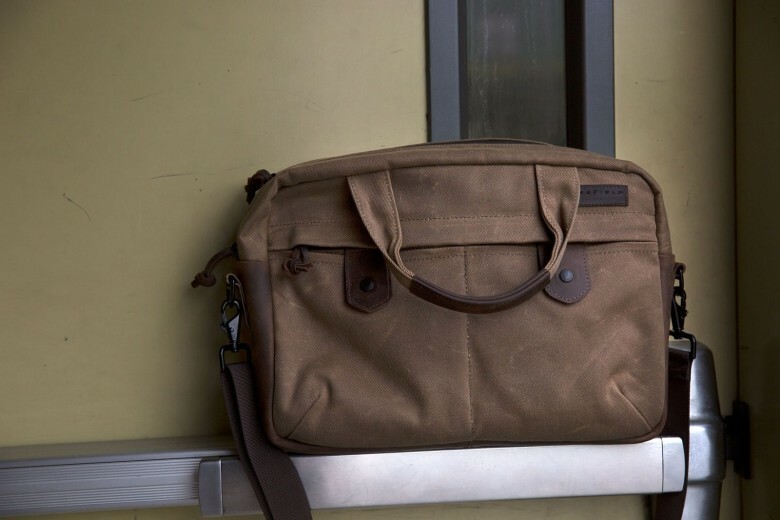 The brown waxed canvas bag looked good out of the gate (and even better after a few trips gave it more character). The chocolate leather accents, including a thick bottom that's perfect for keeping grime at bay, seem like they will only look better over time. A leather-faced pad on the removable shoulder strap boasts a grippy, rubberized back that keeps the Bolt from sliding around. And speaking of not sliding around, the simple pass-through on the back of the Bolt is perfect for sliding the petite bag over the handle of a piece of carry-on luggage.